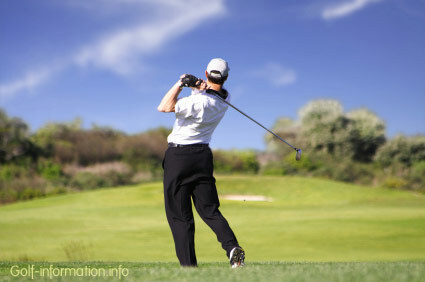 Different types of golf shots are used depending on the spot from where the ball is being played. The opening shot is called the tee shot, while approach shots or feel shots, such as chip, pitch and flop shots, are played from outside the green into the green. The shots played on the green are called putts. Each shot is usually played with its own specific type of club, although it is possible to play a range of different shots using only one club, modifying only the speed and direction of swing. A tee shot is the first shot played from a teeing ground. It can be made with a driver (i.e. 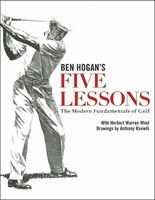 a 1-wood) off a tee for long holes, or with an iron on shorter holes. Ideally, tee shots on long holes have a rather shallow flight and long roll of the ball, while tee shots on short holes are flighted higher and are expected to stop quickly. 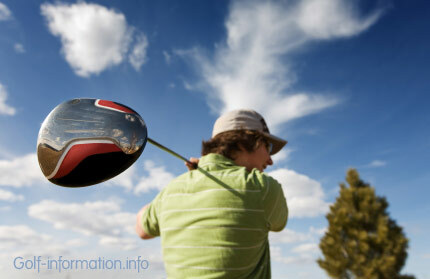 A fairway shot is similar to a drive when done with a fairway wood. 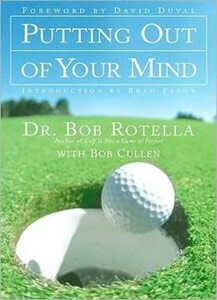 However, a tee may not be used once the ball has been brought into play, therefore playing from the fairway may be more difficult depending on how the ball lies. If precision is more important than length (typically, when playing on narrow fairways or approaching a green), irons are usually played from the fairway. Irons or wedges are also often used when playing from the rough. A bunker shot is played when the ball is in a bunker (sand trap). It resembles a pitch and is done with a wedge. On the green, putts are played along the ground. Pitch: a high approach shot that makes the ball fly high and roll very little, stopping more or less where it hits the ground. Pitches are usually done with a wedge. Flop: an even higher approach shot that stops shortly after it hits the ground. It is used when a player must play over an obstacle to the green. This high lob is usually played with a sand wedge or a lob wedge. Chip: a low approach shot where the ball makes a shallow flight and then rolls out on the green. Chips are done with a wedge or “short” (higher-numbered) iron. Now that you have an overview of the different types of shots, you may also want to investigate a bit further about the different scoring systems and how handicap systems are calculated. We also recommend you go through the golf rules and golf etiquette pages, and of course, have a look at the safety tips on the golf course. However, one of the most important things in performing these golf shots correctly is choosing the right equipment, tailored to your level. This may considerably help you in ‘masking’ your temporary shortcomings in the game. To help you make the right choice, we advice you first have a quick look at the articles explaining the different types of clubs. If you are new to the game of golf, make sure you also read this article explaining the basic set equipment for the novice golfer.